Think carefully before you use chemicals in the garden. You may destroy the singing trees. It’s midsummer so it’s been pretty hot and sunny in recent weeks but of course this is the time when most farm work has to be done. After one particularly hard harvesting day earlier this week I was relaxing with my workers under the tree eating some lovely cold watermelon and enjoying the quiet. I mentioned how quiet it was to the guys. One of them waved up at the trees with his fork and said. I knew immediately what he meant. There were no cicadas singing in the trees. We usually have cicadas singing my mid July and with all the hot weather we have had this year which would speed up the larva development into adults they should have been out sooner but here we are in early August and still not one singing tree. Where have all the cicadas gone? Gone the way of the bees and the other insects , no doubt about it. Since these new pesticides came along the number of insects we have good bad or indifferent has plummeted. While we are go well beyond organic farming and use absolutely no chemicals at all that does not mean that our neighbors dont use them. The problem is that bugs fly around. That can be a good and bad thing. Its bad if you dont want a pest in your garden or in our case farm and dont want them flying in from outside to infest your crops. However the flipside is that if you have good and beneficial bugs or bees on your property you dont really want them flying off to some other farm to get zapped by their nasty chemicals. Sadly unless you have a really BIG farm which these days are only owned by massive corporations who dont care about the bees, then its impossible to have enough land to keep the good insects on your property and not straying into areas that are dangerous to them. The farmer on our eastern side is a soy bean farmer. He plants soy beans every year, and has done since we bought the farm. Never gets a really good crop from it (surprise, surprise) but he dutifully puts on his chemical fertilizer and then sprays his field later in the year. Even though we have a thick line of trees and vegetation between us and his field if he chooses to spray on a day when the wind is blowing then something is likely to reach towards us. Plus bees and other insects are bound to go and investigate the flowers once they start to bloom. A new farmer has started working on the other side of the road too. Fortunately he is farther away from our fields because I suspect he uses more and different sprays than the soy bean farmer. So if our healthy bees and bugs fly around and if they decide to go check out his field when he sprays or go anywhere near it or get caught downwind of it then they are gonna die. Is this a good thing? Personally I dont think so. Sure we get rid of a few pest species and produce absolutely perfect looking vegetables and fruit but what is the true cost? Killing every bug for a mile around your spray area is not good practice. There are a lot more helpful and useful bugs than there are harmful ones and even though most people dont like creepy crawly bugs we really could not live without them. Bees are only the tip of the iceberg. We have no idea what the repercussions of killing a lot of other different species off will be to us. What I see happening is the tough unwanted insects that often do more damage, like ants, survive and the more delicate, beautiful and useful ones are wiped out. 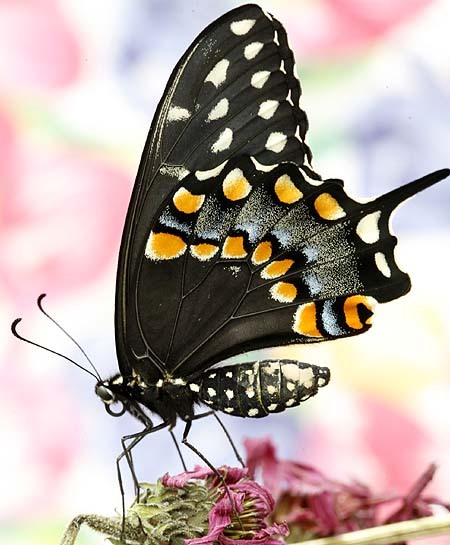 Most people want to see pretty ‘bugs’ like this swallowtail butterfly in their gardens. Dont assume that its all farmers doing this damage to the insects. Homeowners are a major use of chemicals and toxic products and often use them in much higher concentrations that farmers do. Sadly so many people have no idea how dangerous and damaging such chemicals can be. Just because its freely available purchase and easy to come by does not mean its not toxic to humans, pets, wild animals and all the other bugs not just the few that you are trying to kill. Please think very carefully before using any chemical on your plants. Dont just spray the plant as a precaution or because it looks sick. Make sure you know what is wrong with it and how to treat the particular problem before reaching for the chemicals. Dont just kill bugs because they are there. Not liking bugs around your property is not a reason to grab the chemicals and kill them. Dont spray just because you can and NEVER spray if there is any wind at all. It can get the chemicals on you, your family as well as your neighbors and even homes half to a full block away. One person with a can do a lot of damage with a single spray bottle of toxic chemicals. If you have planted a diverse garden less chemicals or often no chemicals at all will be necessary. The more different flowering plants you have the more likely it will be that you dont get pests other insects are only too happy to come and eat them up. Most bugs are not interested in you and just want to go about their little lives without bothering anyone, or in a lot of cases joyfully chomping down on the nasty pests that are in your garden. Remember also that those annoying caterpillars that eat your plants can turn into beautiful butterflies so think hard before you pick them all of you plants and kill them. 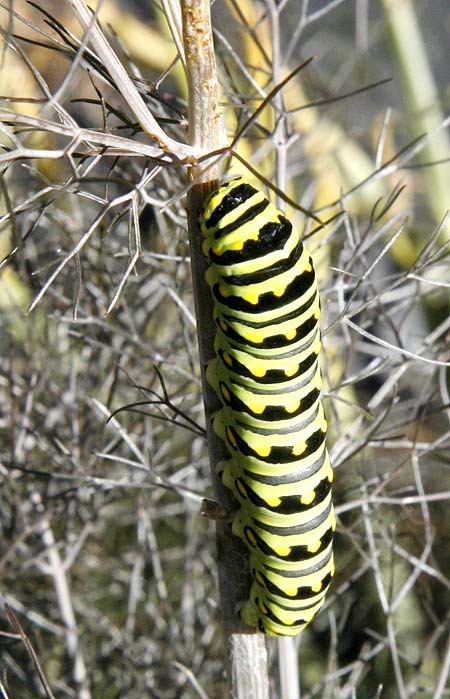 If you want swallowtail butterflies then don’t kill off the larva. Leave the caterpillars alone so you get to enjoy the butterflies. Our farm is just not the same in the summer without the singing of the cicadas. To me they are the sound of summer and working in the fields to a orchestra of cicada song makes the job more enjoyable. 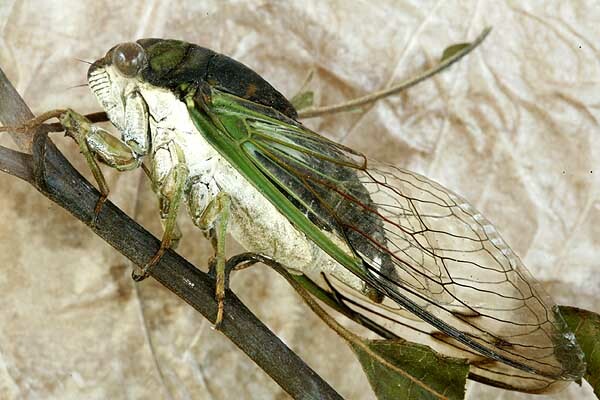 Cicadas dont do any damage to crops, most people never even get to see one since they live up in the trees. Most people are have more experience with cicada killer wasps, and often are afraid of these gentle creatures that do us no harm and just prey on cicadas. I have seen a lot around the farm this year but they all look frantic with erratic flying patterns. These animals will most likely die out this year since there is not food for them. What other creatures also rely on the cicada or the wasp or other parts of the cicada life cycle. We have no idea what damage we are causing by eradicating just one kind of bug and most likely wont know for years until we discover a whole part of our ecosystem has collapses and its too late to rebuild it. I miss my singing trees but sadly cicadas dont usually fly that far so once they are destroyed in one area it could take a lot of years before they repopulate my trees and they sing again. Perhaps they never will. Author Janice Hazeldine PhDPosted on August 8, 2017 August 8, 2017 Categories garden concepts, polinatorsTags cicadas, dont kill the bugs, dont use garden chemicals, killing bugs, look after the bugs, save the bees, save the cicadas, singing trees, toxic garden chemicals, using chemicals in the gardenLeave a comment on Think carefully before you use chemicals in the garden.